Years ago, my grandmother gave me all of her cookbooks. Among the bunch was one called “Loaves and Fishes”, which I naturally assumed was a church cookbook; Quite the contrary. It was written by the owners of a catering and specialty foods store in Long Island. The book had been given to my grandmother by her daughter (my aunt) whose inscription in the book said “Mom, now you can make the fabulous brownies we had in New York” As if. My grandmother has always been perfectly happy with brownies from the grocery store bakery. Cloning fancy Hamptons brownies was not something you’d see on her agenda. My agenda was a little different. These are definitely not cake-like, but they aren’t “baked fudge” either. They are dense and light and the same time. The refrigerator is probably the place to preserve them, but these brownies taste best at room temperature. Whatever you do, don’t overbake them. In my oven, which is perfectly calibrated of course, 22 minutes was the max. I know this because the brownies near the edges aren’t as good as the ones in the middle. 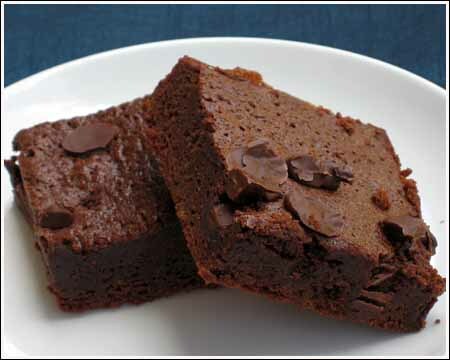 In the Loaves and Fishes book, the authors say that this brownie recipe is reputed to be the original William Greenberg recipe. Then they go on to joke that a lady in Florida gave them the same one. So who knows. I've played with this recipe over the years and it is now one of my favorites. Whipping the eggs and sugar gives the brownies a lighter texture. For fudgier brownies you can underbake them slightly (24 minutes) but I prefer them at baked for about 28 minutes. Preheat oven to 350 degrees F. Line a 13×9 inch metal pan with nonstick foil. Melt the chocolate and butter together in a small saucepan set over low heat, stirring often. You can also do this step in a double boiler or in the microwave. In a large mixing bowl, preferably a stand mixer fitted with a whisk, beat eggs for about a minute. Gradually add the sugar and let the mixer go for about 10 minutes or until mixer is thick and pale and falls off beater in ribbons. Beat in vanilla. With a heavy duty scraper, fold the melted chocolate (it should be luke warm at this point) to sugar mixture. When mixture is well blended, stir in the flour mixture, then stir in the chocolate chips. Pour into pan and bake for about 28 minutes The toothpick test doesn’t really work here, but if you want to test anyway then keep in mind the toothpick should come out with chocolate on it. Now comes the hard part! Let them cool completely. Lift from pan, place on a cutting board and cut into large or small squares. Best served at room temperature, but they slice a little more neatly when chilled or frozen. Every time I pull these out of the oven I worry that they are underbaked, however, having been warned in the original version from The Loaves and Fishes cookbook, 22 minutes is all you need. I have cheated and gone up to 24. The brownies seem undercooked at first, but after cooling completely and sitting in the refrigerator for at least 12 hours, they are fudgy and delicious. When I put these up in taste tests with other brownies, they usually win. I took the photo outside with natural light. Ignore the chocolate chips in the pictures. I threw those on top when I took them out of the oven. They looked dry on top, but In the end, they were not. Next time I am going to add toasted walnuts. Ella, it was probably the recipe. I’d move on to another one if I were you. Made these brownies and they were great but not Greenberg great. Was it the chocolate? Brand? I was wondering about that. It seems like Ina’s kind of place. The pet name among for it is “Loans and Finances”. Kind of like “Whole Paycheck”. They look delicious! So rich and fudgy! Anna, these look wonderful. My husband is a big brownie fan. I’ll have to try them out and see what he thinks. Anna, you’ve created a monster. How? Well, I absolutely love brownies (though I’m more of a boxed-mix girl) and I recently received a gift fancy bar chocolates. I will definitely have to try out a couple of these recipes. I really enjoy the new site and I’m glad to see you rocking your own domain name! P.S. Are you an edge person or a middle person? I’m a fan of the crunchy corner brownies. Lynne, I did it. Thanks for reminding me. I was being lazy this afternoon. Brownies were in the air today. Yours seems very similar to mine today. 🙂 Now I just have to not eat them all. Can you link the Nancy Bagget brownie recipe?